The Sprint Vital has just gone official and it is a ZTE-made phone with a release date set for June 14th and an affordable $99 price on a two-year contract. One Benjamin buys you a handset with a 5-inch 720p IPS display and a 1.5GHz dual-core Snapdragon MSM8960 processor, running on Android 4.1.2 Jelly Bean. 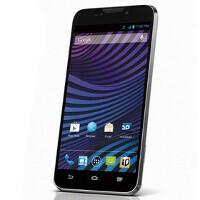 The Sprint Vital features a 13-megapixel main camera and a 1-megapixel front camera for video calls. The battery is 2460mAh and that should easily last you a day. Internal storage is 8GB and expandable via microSD cards of up to 64GB. To get at the $99 price, though, you’d need to go through the lengthy procedure of a $50 mail-in rebate. Hit the full press release with all the tiny details about the Sprint Vital below. Great news for budget-conscious customers: Sprint is about to launch a powerful smartphone that doesn't sacrifice performance or high-end capabilities for less than $100. Sprint Vital™ packs many of today's must-have features, including the latest version of Android™. Sprint Vital is also geared for gamers with a large 5-inch HD 1280 x 720 IPS display with break-resistant LCD and a 2,500 mAh removable lithium-ion battery that offers up to 15 hours talk time. To help take advantage of the built-in gaming capabilities, it comes preloaded with EA Mobile's Real Racing 3, offering trailblazing features, including officially licensed tracks, an expanded 22-car grid, and more than 45 meticulously detailed cars from makers like Porsche, Lamborghini, Dodge, Bugatti and Audi. Racing with friends gets kicked into another dimension with the reality-bending Time Shifted Multiplayer™ (TSM) technology. WHy would sprint get this phone? ZTE Flash and ZTE Force was quite unsuccessful. I dont see any point putting money into this phone. I would rather get few more nice messaging phones as Sprint doesnt have a great selection of msging phones.